What’s been happening since I last blogged? Lots of stuff… but let’s talk about what inspired this post: I’m doing a vegan challenge. Yep, you know what this means. Vegan-themed posts for the next little while. This also means: no meat, no eggs, no dairy, no gelatin, no honey. And when I say no dairy that also includes… gasp… butter! ohhh how can I bake without butter?! It really is unfortunate that some of my favourite treats aren’t vegan (milk chocolate, cheesecake, frozen yogurt, custard, and whipping cream.) Some vegans will even choose to not eat white sugar as there is a chance of it being processed using charred animal bone. For the challenge, I’ve chosen to not go that far. I think I would go into withdrawals if I had to give up sugar. Now before you get all worried that I’m turning into a vegan-hippie who will from now on only post recipes with tofu, I’m going to set the record straight: I am not turning into a hippie, vegan,vegetarian, or anything else along these lines. I’m avoiding labelling myself as anything… I’m still the same baking-loving Ashleen who just wants to make some changes to the way I eat. The vegan challenge is only temporary, but once it is over I won’t be going back to my old eating habits either. For example, I will be avoiding meat unless I feel ok about the source. Even then, I will most likely only eat it on rare occasions. I will also be using many different dairy-free alternatives (coconut ice-cream is one of the best things around, and I really happen to love almond milk, hazelnut milk, coconut milk, and even soy milk.) Family gatherings or special events will probably be exceptions for me because that has been the most challenging part of this temporary vegan kick: not being able to eat what everyone else is eating in a social setting. So if I know that I most likely won’t stay a vegan once the challenge is over, why do I bother? Mostly because of awareness. I think a lot of my friends and family are learning more about veganism as a result of this, and I am learning more about the challenges of being a vegan. It’s actually not that difficult when you know the changes are temporary. However, I have developed a lot of respect for vegans who have decided to make the change permanent. Can you imagine saying no to cheesecake for the rest of your life? There were many reasons for this change in diet. It is really easy to just buy your food from the grocery store and not think much about it, but if you really start to think about where this food is coming from, it isn’t as easy to eat without feeling guilty. When you hear all the arguments about why a plant-based diet is the way to go, they are hard to ignore. The main reasons for going vegan are: ethical treatment of animals, environment, or health reasons. Also, all the celebrities are doing it so it is clearly the cool thing to do. Another motivator for me is that cutting back on animal products is said to be the most important thing we can do to reduce our carbon footprint. The meat industry alone contributes to far more greenhouse gas emissions than transportation. I’ve seen numerous different stats, but this one came up on a lot of sites: If everyone in the U.S. ate no meat or cheese once a week for one year, this would be like taking 7.6 million cars off the road. Now, the last thing I want to do is sound all preachy. Bottom line is that everyone should be able to eat what they want without judgement from others. Making changes to your diet is not about perfection. Every small change (for example, cutting out meat once a week) makes a difference. I think many people would agree, that the ideas of being compassionate towards animals and being better to the environment sound great but the thought of becoming a strict vegan just sounds too hard. Making small changes in the right direction is going to be much more effective than the all-or-nothing approach for those who can’t commit to a vegan diet. It is almost like someone dieting to lose weight: if they deprive themselves too long, there is a good chance that a major chocolate-binge will ensue. BUT that is more than enough vegan talk (I do apologize for that long rant.) 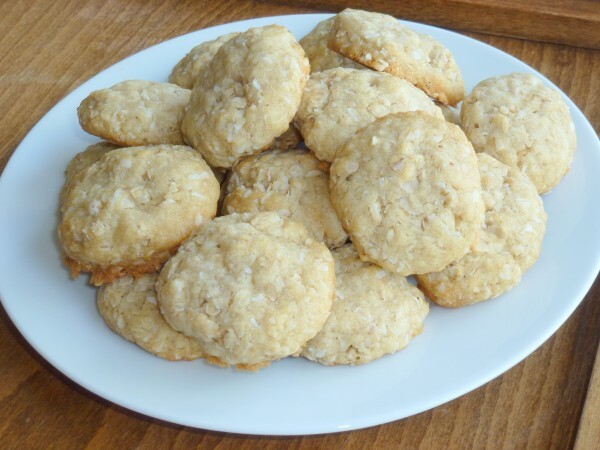 Let’s get to the real reason you are reading this post: Coconut Oatmeal Cookies! These bad boys are totally plant-based and totally yummy. I even got the nod of approval from several non-vegans so these are something that everyone can enjoy! Cream together coconut oil, vanilla, and sugars. Blend tofu in food processor or blender until completely smooth and mix in with oil-sugar mixture. Sift together flour, baking soda, and salt. Mix into wet ingredients. Drop spoonfuls onto cookie sheets and bake at 350 F (175 C) for approximately 10 minutes. They should be golden on the bottom and still gooey. They will continue to set as they cool.